The train of marketing for the next chapter of The Hobbit trilogy, The Desolation of Smaug, officially starts with the first still of Tauriel. 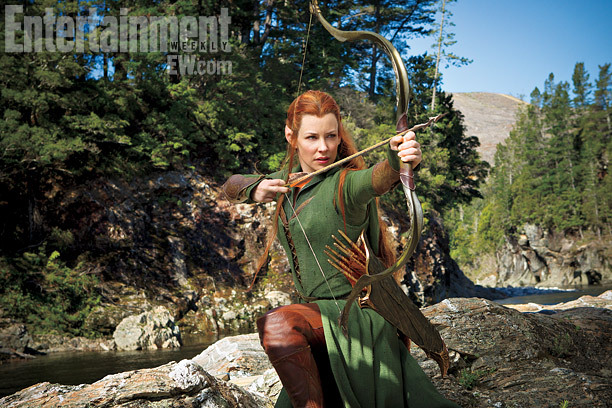 Evangeline Lilly, who plays the said character, is featured in this new photo, which debuted over Entertainment Weekly. You can check it out here below. Tauriel, as you may have known, is not found in any of J.R.R. Tolkien's works. She is however a creation of the long time screenwriters of the Middle Earth movie adaptations - Peter Jackson, Fran Walsh and Philippa Boyens. Her character will give way to a more detailed look on the life of elves in Mirkwood Forest and of course to give some girl power in this male dominated tale. "Tauriel is the head of the Elven Guard. She’s a Sylvan Elf, which means she’s of a much lower order than the elves we all became acquainted with in The Lord of the Rings. She doesn’t hold the same kind of status that Arwen or Galadriel or Elrond or Legolas do — she’s much more lowly. She sort of goes against the social order of the elves a little bit." The Hobbit: The Desolation of Smaug hits theaters on December 14, 2013. Jump over to EW to know more about Evangeline Lilly's character.